Here's some of Jimmy Deguara's photos from 5th May US chase. A rain wrapped tornado occurred just to the north. This spun up very close to our vehicle and exhibitied incredible inflow jets and very tight rotation. Very spectacular! When you say flanking line tornado what do you mean? I assume you would mean a landspout. I recall many of the tornadoes that we saw in SE Nebraska on May 24, 2004 were what I'd assume to be flanking line landspouts. (i) Did you have fresh vigorous convection above you or any signs of cloud base rotation or a funnel cloud? (ii) Did the soundings, or models, indicate substantial low-level CAPE and steep low level lapse rates. Was there evidence of a psuedo-cold front (I guess was the parent storm a supercell), or was there evidence of any other boundaries in the vicinty? Not sure actually whether a landspout occuring with a supercell is named a flanking line tornado if this is where your argument was coming from? The term was used by Gene Moore (and another National Weather Service employee) in my discussions with him even after I had suggested we had passed through a steep gradient of cool to warm air - basically a boundary. There was a small circulation above which was labelled by other chasers as the anticyclonic couplet - whether this has been verfied I cannot tell you. I do know that briefly in footage shot there was a a nub in the base and a spiral base. 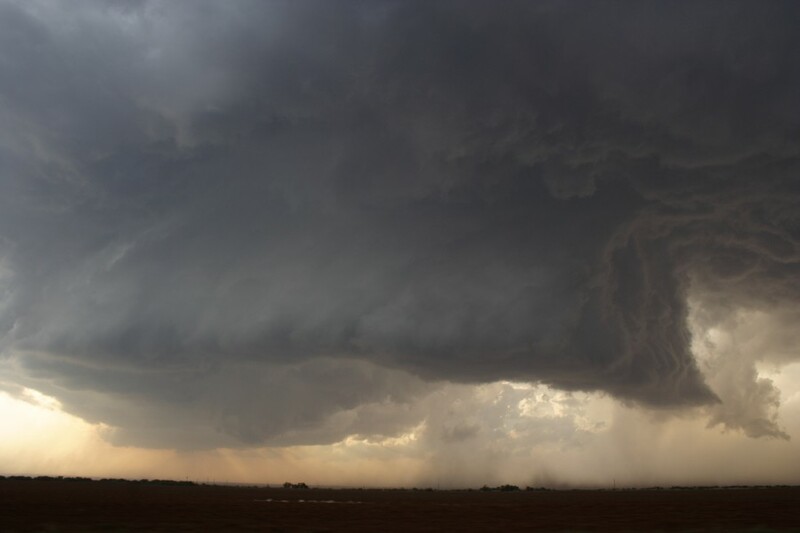 The base was part of the flanking line of the supercell that was producing a tornado in its mature stage a that particular time embedded in rain. David what are your thoughts of what is occurring here? There is obviously no doubt of it being a tornado based on several reports. As you say, there is no doubt at all that it is a tornado, based on your observations and those of others, hence it is more question of the mechanism. It would be impossible to determine whether this was a landspout, an eddy associated with the main circulation, or the result of an anticyclonic member of a vortex couplet, at least from where I stand Gene would probably be the best person to shed some light on what was most probably occurring? I'm curious though, was the main rain-wrapped mesocyclone and tornado to the south of the anticyclonic tornado? Did you observe an RFD with the storm. There are many interesting tornado 'pairs' when you think back - May 15 '03 (Stratford), May 3 '99(Moore) and numerous others that I cant think of tonight. Oh, also May 24 '04 as I mentioned (well, ok, triplets in that case!) - these clearly develop along the flanking line and were typical landspouts - the flanking line assumed the appearance of an elongated, linear base at ground level. In contrast, the (smaller) Moore tornado (well based on the video I have seen) appeared trapped within the main low-level circulation and was orbiting the huge F5 stovepipe - a different situation. Therein lies the interest in the tornado that you caught - its genesis with respect to the storm scale processes in effect at the time. My question is - are you suggesting flanking line tornado and landspout tornado as similar mehcanisms? "I'm curious though, was the main rain-wrapped mesocyclone and tornado to the south of the anticyclonic tornado? Did you observe an RFD with the storm." I am assuming you meant to ask was the main mesocyclone rain wrapped tornado north of this dusty tornado - and the answer is yes. And yes there was an RFD thence the cooler air to warmer transition as we neared the development of the tornado. Great discussion - I think both you and I are on the same line of thought as to the mechanism. Hi Jimmy - I think a flanking line tornado is exactly that - I assume it to be a general term for any tornado that occurs under the flanking line. I'll stand corrected if it refers to a particular process going on under the flanking line, and if so I'm not familiar with it. I would have thought that the majority of tornadoes that occur under the flanking line would be classed as landspouts since new updrafts would provide a good opportunity for vortex stretching? So, to answer your question, no, since they are describing things at different levels. Actually, it is probably worth clarifying a few things starting at the top. It seems the basic distinction is made between mesocyclone and non-mesocyclone tornadoes. Well I would assume this sort of nomenclature places emphasis on the former being, generally speaking, a much greater risk to life and property. 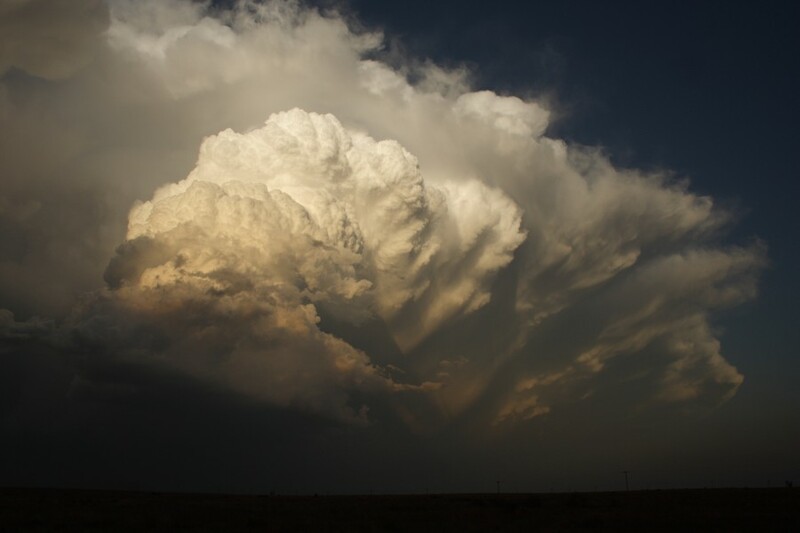 A non-mesocyclone tornado, of which landspouts are a type, by their very definition occur not necessarily in the absence of, but more or less independently of the dynamical process that is a mesocyclone. [ as an aside, the Jarrel event might imply that a single tornado under a particular set of conditions might be borne as a non-mesocyclone tornado and, as the storm-scale processes evolve (-> supercell), make the transition into a mesocyclonic tornado (that is as soon as the tornado was the product of a low-level mesocyclone, even though a tornado was on the ground preceding meso formation!). At the other extreme, in the case of some rope-out phases (think about May 12, 2004) the tornado appears to be on the ground even though the fully occluded meso is probably no longer a mesocyclone at all by all the standard criteria - does it then become a non-mesocyclone tornado during the process of it's demise,,,,,, anyway that's pretty ridiculous]. The point being, a whole bunch of dynamical processes are lumped together (eg landpouts, coldies) as non-mesocyclone tornadoes. A landspout would appear to favour an environment where an updraft can stretch pre-existing vertical vorticity to produce the tornado - the normal situation here would be an environment characterised by some sufficient amount of low-level CAPE and a existing surface boundary to serve as a source of vertical vorticity. This occurred on May 24, 2004. While, yes, there was a mesocyclone that produced at least two mesocyclone tornadoes, the other tornadoes that formed under the flanking line did not require the presence of that mesocyclone per se (of course one could say that they in fact did in that the flanking line would not have existed if the supercell did not exist but, as Dr Chuck Doswell would say, that is reductio ad absurdun )....you get the drift. So, in summary, the tornado in question was possibly a landspout - this would imply the fortuitous co-existence of the ingredients mentioned above - the thermal boundary that you noted would imply there was pre-existing vertical vorticity in the region. 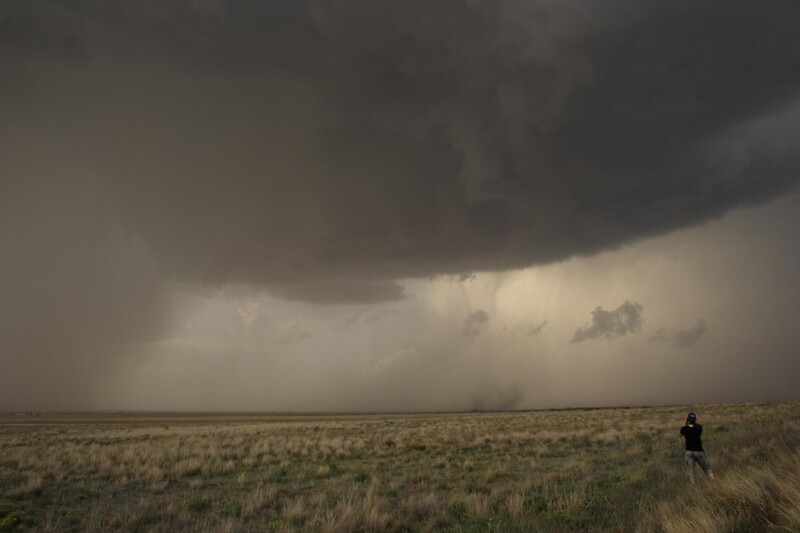 If it wasn't a landspout, perhaps it may have developed along the RFD as the anticyclonic member of a vortex couplet --> Read Chuck Doswell's essay as linked below. I'll be interested to read your report buddy I wish we had more time to view that piece of video and discuss it! I would estimate that the distance between the main tornado within the rain - see Daniel's shadow evidence of the tornado above and the dust filled tornado would have been a couple of miles or perhaps a little more? Not sure - I would have to look at the preliminary survey map once again. You are welcome to observe the footage of the storm once again - just say when. Time is required for this. Thanks for sharing that video Jimmy. Awesome stuff. Glad you enjoyed this Steve, it is now the closest we have been to a tornado. Also an eye opener that a tornado can touch down with a circulation you did not focus on. What if it became violent - no escape route. 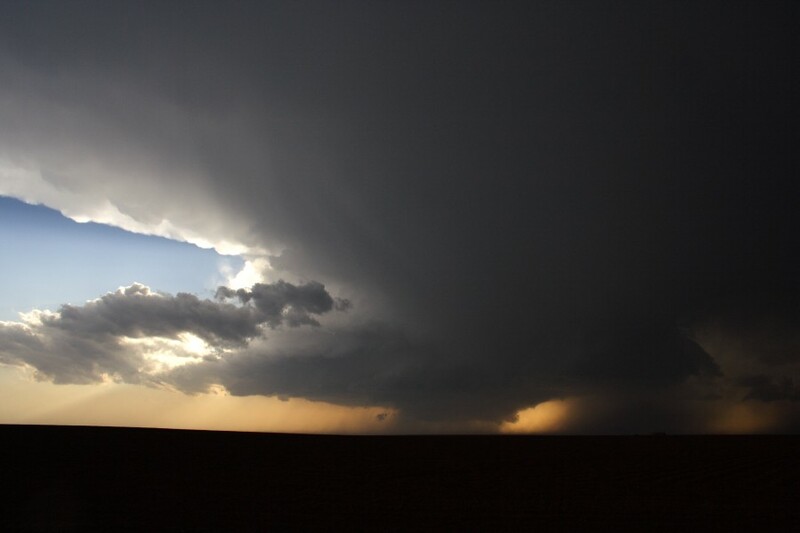 only saw 1 decent -- what I will classify as a gustnado -- near Perryton NW Texas 27th May. as a tornado, but generally with waterspouts presence of moisture isnt an issue. Therefore isnt the name "waterspout" or "Landspout" just a variation in name ? It might be a good idea for you and anyone else interested to have a read of this article by Chuck Doswell which might prompt some further discussion. Waterspouts, landspout, coldies (as in tornadoes not cbs), mesocyclonic tornado, flanking line tornado etc etc are all tornadoes, by definition. They are, potentially, distinguished, by the different dynamical processes from which they result. To that end, a landspout, as I noted above, is an example of what are termed non-mesocyclonic tornadoes -- tornadoes nonetheless. Remember this is taxonomy; attempting to best categorise a natural continuum -- hence it is subjective. few days ago I found this cool video shot by Amos Maglioco. What I find very interesting are the "intro" frames for each of the tornadoes saying "tornado 3" and "tornado 6". Are those numbered tornadoes, meaning there were at least six of them? I thought only 2 were included in report, the rain wrapped and the one being the discussed above. On what grounds does he count tornadoes? I mean, you can clearly see in the video that it became rain wrapped, nobody can tell that old one dissipated/new one formed, even though the shape of it, when it becomes visible again, is different. Sorry for a bit of OT, but I can't get these 6 tornadoes out of my head. :D They saw it/them merely because they were on the opposite side of us, north(western) I guess.